A little FJ40 Background: The FJ40 Series was sold in the U.S. from 1961 to 1983. This model Land Cruiser is considered the "Classic" of all Land Cruisers. It is a two door vehicle with removable hardtop and all are equipped with four wheel drive. Some early model FJ40s were sold with factory softops. Early model 3 speeds and were replaced in 1974 with a 4 speed transmission. Two engine types were offered through this period, the 3.8 liter 6 cylinder F engine (1963 to 1974) and the larger 4.2 liter 2F engine (1975 to 1983). CCOT Restores: 1976 through 1983 FJ40s. These year models have the features most desired by the mainstream market; i.e... Disc Brakes, Larger 2-F Motor, 4-speed Transmission, and Rear Ambulance Doors. We will occasionally purchase a 1975 and older to restore if body is rust free and overall condition is immaculate. Cool Cruisers of Texas searches out and buys the top FJ40s from non coastal and salt free regions of the southern United States and restores these select Land Cruisers to "Original Condition". CCOT specializes in restoring only Rare FJ40s. FJ40s selected to restore are naturally rust free and with low miles. Completed FJ40s are sold to buyers throughout the U.S. We have restored over 500 FJ40s since 1989. Located in Rowlett, Texas (a Dallas suburb), we remanufacture FJ40s in our specially tooled 20,000 sq. ft. Land Cruiser facility. 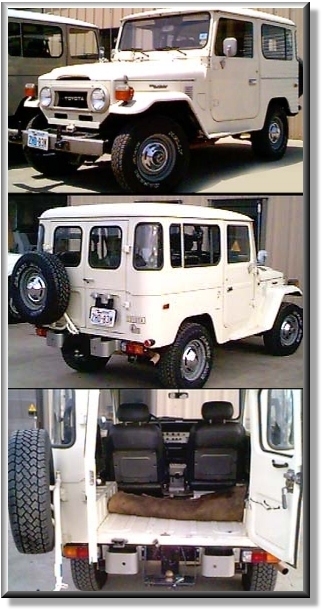 CCOT technitions have restored more FJ40s than anyone in the U.S. and their skill and vehicle knowlege is second to none. CCOT has the top FJ40 Craftsmen in the Nation. Cool Cruisers of Texas offers you a second chance to buy the FJ40 Land Cruiser you always wanted! CCOT only restores Land Cruisers that we purchase to resell. We are currently too backed up to restore Land Cruisers for Customers at this time. CCOT's Restoration process begins by disassembling the FJ40's body. The hard top is removed and dismantled. All body attachments inside and out are removed from the body - including doors, hood, fenders, glass / seals, hinges, roll bar, seats, bumpers, all attachments, etc. After disassembling, 108 individual parts are sandblasted to white metal and sealed with self etching primer for the ultimate rust protection. Each part is hand sanded three times before painting to assure the ultimate smooth finish. A CCOT "Exclusive Body Prep Process" provides the greatest rust protection and metal prep for our FJ40s than those found anywhere else. All body parts are individually painted before reassembly. Note: Not all CCOT FJ40s are sand blasted due to like new condition. Once reassembled, the FJ40 receives six final coats (rather than three coats as per factory) of factory acrylic enamel paint for a factory superior finish. Roll bar, seat frames, center console, instrument panel, glove box and door are repainted, as well as the entire interior. Emblems are replaced with new. Hood hooks are replaced with new. Turn signals are replaced with new. Front and rear bumpers are replaced with new. Top and front grill is refinished to new condition. Front windshields are replaced with new. The fit and finish of our exterior detail is unequaled by any. Note: Not all dashes are painted if already in like new condition. The FJ40 interior receives new seat upholstery, headliner, new gear shift boots and knobs, new seals around doors and new window channels. Our FJ40s seal tight and do not rattle. Many other interior details are performed from new foot pedal pads to new radio/antenna. Dash pull knobs are all refinished as well as rear heater is bead blasted and refinished. Inside vinyl door panels and sun visors are replaced as needed. Rear jump seats are restored to brand new condition. All door bushings and tire rack bushings are replaced to eliminate rattles and provide proper door fit for a lifetime. New front seat belts with shoulder harnesses and new rear lap belts are installed on all FJ40s to deliver that totally new interior look and function. New hardware: All nuts/bolts and much of the FJ40 hardware is re-plated to its original factory look with a non-corrosive yellow zinc plating. Finished interior looks and smells new. The detail and quality of our caring FJ40 workmanship is unequaled. Mechanical - All vehicles are thoroughly checked and mechanical repairs made. CCOT wants to deliver every FJ40 in top mechanical condition and will make repair or replace any mechanical flaw that we can identify. Note: Some mechanical flaws cannot be identified by CCOT until vehicle has been driven extensively. Our many test drives may not always reveal every mechanical flaw. 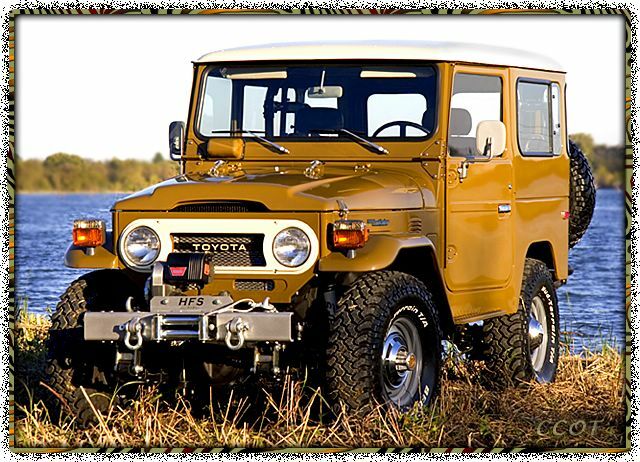 Our objective is to deliver a beautiful and reliable FJ40. Engine - All FJ40s are checked for compression, oil leakage (excluding normal seepage), cracked block or head, and abnormal exhaust discharge. All carburetors are rebuilt or replaced with new. Also available: Engine Overhaul. This is a complete and professional Land Cruiser 2-F engine overhaul, performed in a "state of the art" machine shop by experienced top level machinists. 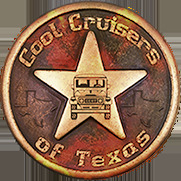 All warranty work is performed by Cool Cruisers of Texas at the Rowlett, Texas location. Note, CCOT FJ40s do not receive an overhaul unless motor tests to be bad. Transmission and Transfer Case - Checked for proper function, cracks or damage, abnormal noise or vibration, improper shifting or functioning in all gears, clutch slippage or chattering. Differential - Check for fluid levels, leakage (excluding normal seepage), cracked or damaged housing (which is visible), abnormal noise or vibration. Cooling System - Radiators replaced with new 4-Core radiator. All other cooling components are inspected and replaced on as need basis. example: water pump, thermostat, belts (often), hoses (often), etc. Note: Typically all the above cooling components are replaced with new. Electrical System - Checked for improperly functioning alternator, battery (new), starter, lights and signals. Fuel System - Checked for leakage. Often new fuel tanks installed. Accessories - All checked for proper function - gauges, air conditioning, heater, defroster, lights, signals, wipers, radio, etc. Brake System - Checked for proper function (including hand brake) - drums, shoes, pads, wheel cylinders, brake lines and master cylinder, fluid levels checked and adjustments and repairs made. FJ40 is road tested for straight line stop. Most brake parts are replaced with new. Steering System - Checked for too much free play in steering and gear box leaks. Suspension System - Check for ball joint damage, structural parts bent or damaged, steering stabilizer bar function, shock absorbers (new HFS Shocks installed), and rubber bushings. Exhaust System - Checked--repaired or replaced if leakage. Intake and exhaust gaskets often replaced. is installed in ALL Top CCOT Restorations and is comprised of all factory Toyota components. We have installed hundreds of these Power Steering systems to our remanufactured Land Cruisers with outstanding results. Our PS systems are configured per stock Land Cruiser PS, which adds both pleasure to your drive and value to your investment. This Power Steering System is made exclusively by CCOT and is an Option we have offered for 10 years (with very little design change). Details of Motor: Under the hood appearance is always impressive. Valve cover and air cleaner are bead blasted and painted. Hardware is re-plated to its original factory look with a non-corrosive yellow zinc plating. Many other steps are taken to make our FJ40s a "Show Off" under the hood.